Oil and gas industry groups asked the U.S. Supreme Court to strike down state subsidies for economically struggling nuclear power plants. It’s the petroleum industry’s latest attempt to salvage its war against nuclear plant subsidies that has so far been unsuccessful in the courts. The American Petroleum Institute (API) and Natural Gas Supply Association (NGSA) filed an amicus brief Monday asking the high court to take up the Electric Power Supply Association’s petition to reverse a lower court decision. “We hope the Supreme Court recognizes the gravity of this issue, since wholesale power markets cannot continue to withstand the impact of such state actions,” Pat Jagtiani, NGSA’s executive vice president of NGSA, said in a statement. New York and Illinois in recent years allowed a handful of nuclear power plants to take advantage of zero-emission credit (ZEC) programs to keep them from shutting down amid competition, mainly from low-priced natural gas. 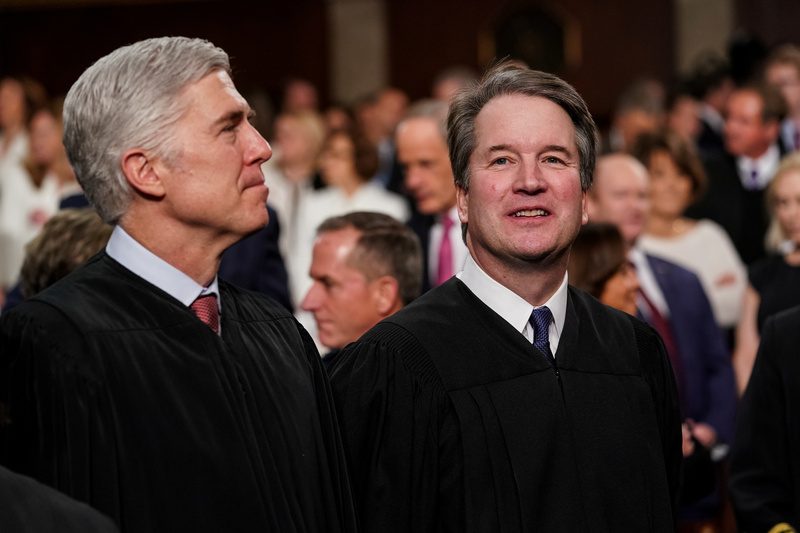 Supreme Court justices Neil Gorsuch, left, and Brett Kavanaugh at the Capitol in Washington, DC on February 5, 2019. Doug Mills/Pool via REUTERS. States see nuclear plant subsidies as a way to meet goals to cut carbon dioxide emissions. Nuclear power is the largest source of zero-emissions energy and supporters say closures only increase emissions because of increased natural gas use. Federal courts in Chicago and New York ruled against the oil and gas industry and upheld state nuclear subsidies in 2018. The Electric Power Supply Association petitioned the Supreme Court to hear its case against nuclear subsidies in January. “ZEC subsidies drive up costs to consumers by prolonging the life of uneconomic, aging resources,” Jagtiani said. However, legal experts are skeptical the high court will take up the Electric Power Supply Association’s petition. “I would estimate that the petitioners have less than a 10% chance of certiorari being granted, given the absence of any disagreement between the two appellate courts over the legality of the ZEC programs and the US government’s position on pre-emption,” Gordon Coffee, an attorney with law firm Winston & Strawn, told S&P Global Platts.